The publishing activity of the Faculty of Law is carried out by the Publishing Centre, which oversees the publication of monographs, text books, law treatises, and other scientific and theoretical volumes written by the faculty. The Publishing Centre is also in charge of publishing the law journal Annals of the Faculty of Law and other materials intended for students. The Centre comprises a bookstore in which all the Faculty publications and materials are available, together with books published by other publishing houses and authors that are required for the courses taught at the Faculty. Annals of the Faculty of Law in Belgrade is the oldest Balkan academic law journal, having been founded in 1906 by the University of Belgrade Faculty of Law as Archive for Legal and Social Sciences (Arhiv za pravne i društvene nauke). 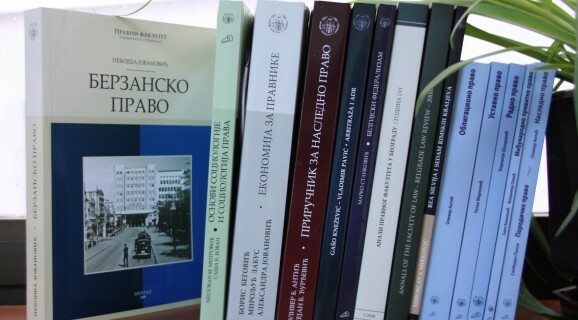 Since 1953 the journal appears as Annals of the Faculty of Law in Belgrade (Anali Pravnog fakulteta u Beogradu). 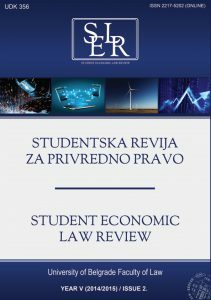 This law review has been published continuously in Serbian with abstracts in foreign languages, offering contributions by the faculty and distinguished scholars from former Yugoslavia, Serbia and abroad. Its Editors-in-Chief have been the most prominent Serbian law professors and lawyers, such as Mihailo Konstantinović, Milan Bartoš, Vojislav Bakić, Vojislav Simović, Obren Stanković, Dejan Popović, Miodrag Orlić, Danilo Basta, Sima Avramović, Miroljub Labus and Mirko Vasiljević. 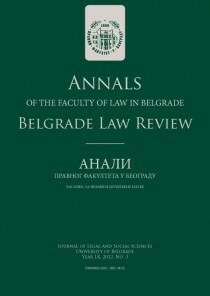 Since 2006, the law review has added one international edition annualy as Annals of the Faculty of Law in Belgrade – Belgrade Law Review. It is a peer-reviewed journal that utilizes an international body of editors, advisers and referees to select outstanding contributions. The journal solicits articles, contributions, case law and legislation comments, essays, debates, notes and book reviews on all aspects of law and social sciences, being interdisciplinary oriented. Special emphasis is placed on contemporary legal developments, but the journal’s range includes jurisprudence and legal history. The journal serves as a forum for the expression of the legal ideas of foremost scholars, law professors, jurists, judges, practitioners, societal leaders and students. International Editorial Board: John Cerone (Tufts University, USA), Silvio Ferrari (University of Milan, Italy), Kenneth Einar Himma (University of Washington, USA), Christa Jessel Holst (Max Planck Institute for Comparative and International Private Law, Hamburg, Germany), Thomas Koenig (Northeastern University, USA), Peter Koller (University of Graz, Austria), Janez Kranjc (University of Ljubljana, Slovenia), Werner Krawietz (University of Münster, Germany), Rainer Kulms (Max Planck Institute for Comparative and International Private Law, Hamburg, Germany), Ingeborg Maus (Goethe University Frankfurt, Germany), Thomas Mertens (Radboud University, Netherlands), Slobodan Milačić (University of Bordeaux, France), Paul du Plessis (The University of Edinburgh, Scotland), Vesna Rijavec (University of Maribor, Slovenia), Željko Šević (Sohar University, Oman), Gerhard Thür (Institute for the Study of Ancient Culture, Austria). 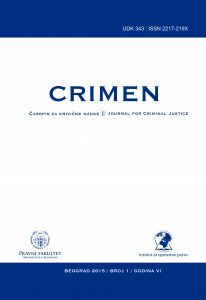 Crimen is the journal for criminal justice and it is published semiannual (April and October). 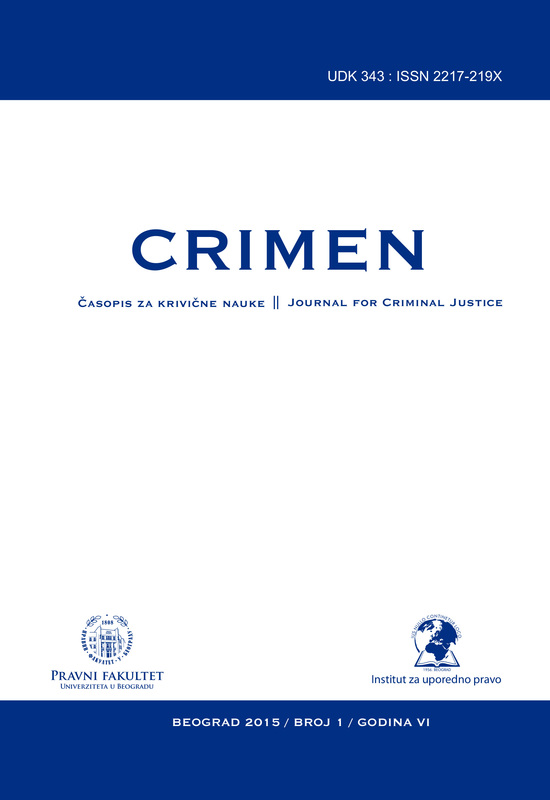 Publishers of the journal are University of Belgrade Faculty of Law and the Institute for Comparative Law in Belgrade in cooperation with the Criminological section of Serbian association for criminal theory and practice. Scientific council is consisted of foreign members (Prof. Dr. Hans-Jörg Albrecht, Prof. Dr. Jacqueline Azzopardi, Prof. Dr. Michael Bock, Prof. Dr. Serge Brochu, Prof. Dr. Christian Grafl, Prof. Dr. Stefano Ferracuti, Prof. Dr. Dragan Milovanović, Prof. Dr. Eduard Filipovič Pobegajlo, Prof. Dr. Jean Pradel, Prof. Dr. Miroslav Scheinost, Prof. Dr. Ulrich Sieber) and members from Serbia (Prof. Dr. Danilo Basta, Prof. Dr. Miroslav Đorđević, Dr. Aleksandra Rabrenović, Prof. Dr. Dragan Simeunović, Prof. Dr. Snežana Soković, Prof. Dr. Radenko Vuković). Editor-in-Chief is Prof. Dr. Zoran Stojanović. 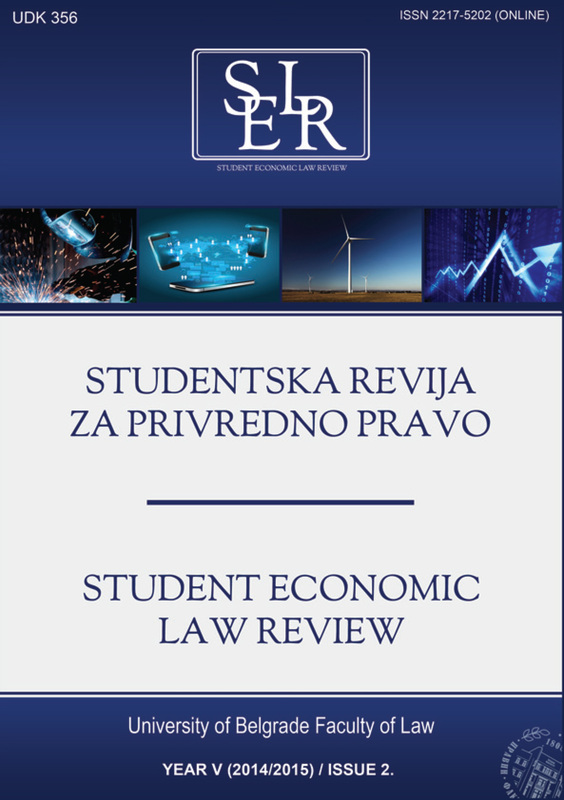 Student Economic Law Review is an online legal journal published twice a year and run by students of the University of Belgrade Faculty of Law. The Review was established in autumn 2010 by Associate Professor of Economic Law and Regulation Tatjana Jovanic and students who attended her workshop in the academic 2010/2011. In addition to papers written by students, the Review publishes also analyses and commentaries of adopted legislation and court decisions. The Editorial Board is composed of students of mainly undergraduate studies. They scrutinize the proposed papers as they are received, and after checking the quality of the work and the overall suitability of the topic, the paper is passed on to prominent member of the legal community for a second assessment. The Review accepts contributions from undergraduate, graduate and doctoral students, from Serbia and abroad.